June 12, 2018 -- Researchers from the Netherlands examined the brain CT scans of patients with memory complaints and identified a strong association between the presence of calcifications in the hippocampus and various risk factors such as smoking and diabetes, according to an article published online June 12 in Radiology. In a retrospective study, the investigators assessed the brain CT scans and cognitive test scores of roughly 2,000 patients at a hospital memory clinic. They found that old age, as well the vascular risk factors of smoking and diabetes, had a positive correlation with hippocampal calcifications. These calcifications, however, were not linked to declining cognitive function. Because brain calcifications are a manifestation of vascular disease, it follows that risk factors for cardiovascular disease such as smoking and diabetes are likely to increase the risk of calcifications in a region of the brain crucial to memory, noted first author Dr. Esther de Brouwer and colleagues from University Medical Center in Utrecht. "Currently, if radiologists decide to report hippocampal calcifications in a radiology report, we suggest reporting their presence as mild, moderate, or severe vascular calcifications in the hippocampus ... with the remark that this is an incidental finding of currently unknown clinical relevance," senior investigator Dr. Pim de Jong, PhD, told AuntMinnie.com. Axial reconstructed brain CT scans of patients with mild (A), moderate (B-D), or severe (E) hippocampal calcifications (indicated by arrows). Image courtesy of Dr. Pim de Jong, PhD. The abnormal buildup of calcium, or calcifications, in the brain's hippocampus is an increasing area of interest in dementia research, according to the authors. Early work in the field has suggested a potential link between hippocampal calcification and the impairment of overall cognitive function. Though calcifications in the hippocampus are common, especially for seniors, little is known about their risk factors and effect on memory, partly due to the frequent misidentification of calcifications in the hippocampus as calcium buildup in the choroid plexus and vice versa, de Brouwer said. 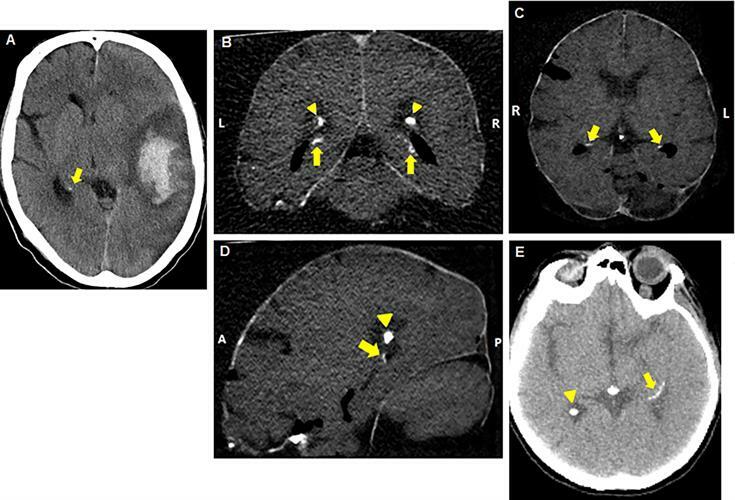 Recently, technological advancements in CT scanning have provided clinicians with improved visualization of calcifications in these small brain structures. Taking advantage of these developments, the investigators set out to identify potential risk factors for hippocampal calcifications in 1,991 patients who presented with memory and cognition complaints at the Tergooi Hospital memory clinic between April 2009 and April 2015. Each of the patients underwent multiple cognitive function tests and a CT exam. Their mean age was 78 years, and 40.3% were male. A total of 380 (19.1%) patients had hippocampal calcifications on their CT scans based on a reading by one of two trained physicians. The physicians rated each case based on the highest degree of calcification -- absent, mild, moderate, or severe -- with "good" interobserver agreement between the readers. A multivariable analysis of the cognition tests and CT scans highlighted a strong correlation between the presence of brain calcifications and the patient factors of being a senior, smoker, and diabetic, even after adjusting for other risk factors such as hypertension and hyperlipidemia. The odds ratio for having a hippocampal calcification was 1.05 for seniors (p < 0.01), 1.49 for smokers (p = 0.02), and 1.5 for diabetics (p < 0.01). Furthermore, there was a statistically significant association between the number of risk factors a patient had and the severity of the calcifications (p < 0.01). For example, there were severe calcifications in only 1.6% of patients with no risk factors, compared with 2.5% of patients with one or two risk factors and more than 14% of patients with three risk factors. A recent histological study conducted by the authors confirmed that these calcifications resided in blood vessels -- further backing the connection between hippocampal calcifications and smoking and diabetes (PLOS One, May 11, 2018). Despite these associations, the present study demonstrated no notable correlation between hippocampal calcifications and cognitive decline. The authors offered several potential explanations for this unexpected finding, including the possibility that the calcifications in this particular group of patients happened not to reach the layer of the hippocampus responsible for memory storage, as well as the limited breadth of the study's population. Another reason for the lack of an association between calcifications and cognition may also be one of the main limitations of the study -- its lack of a control group, they wrote. In response, the researchers plan to carry out "further association studies in different cohorts to better understand the link between these calcifications and cognitive problems," de Jong said.